The heist of art auctioneer Simon (James MacAvoy) and a group of criminals doesn’t go as smoothly as planned, and Simon ends up in the hospital while Frank (Vincent Cassel) – the leader of the gang – doesn’t have the painting that he wanted to steal. Seeking for help, they come across a hypnotherapist named Elizabeth (Rosario Dawson) who tries to retrieve Simon’s memory of what happened to the missing painting. But soon it is hard to figure out what’s real and what’s just a state of trance. 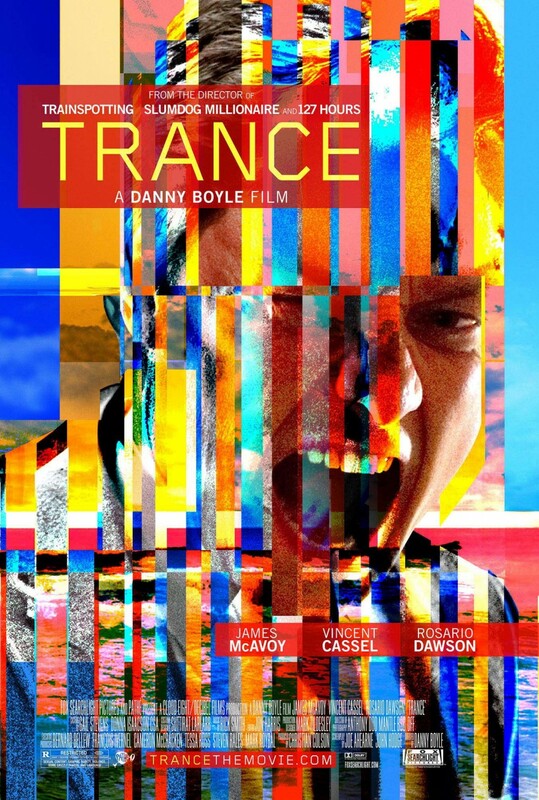 Trance is a movie that sticks with you for a long time after you have finished it, because it is so complex and outrageous, yet very intriguing and fascinating. The cinematography is beautiful and strangely appealing and the storyline keeps the audience clueless until the very end, even though there are a few cleverly hidden messages or moments that are actually hinting towards the conclusion. It doesn’t happen too often that I am awed by a movie, but Trance had me confused, surprised and impressed. Danny Boyle is marvelous director, who never sticks to the same genre, and each of his movies are equally beautiful and stunning. However, I wouldn’t watch most of them more than once. But with Trance he has yet again an amazing cast and a brilliant storyline that will actually leave you gasp for more. Pingback: English- language South Asian Cinema – Movies with Spice | Simon Says... WATCH THIS! Awwww, thank you, that means a lot to me!